What is LMIA (Labour Market Impact Assessment)? Labout Market Impact Assessment or LMIA (formerly known as LMO or Labour Market Opinion) is a letter (sometimes called Confirmation letter) issued by one department of the federal government of Canada. Canadian employers need LMIA if they want to hire a temporary foreign worker (TFW). There are very few exceptions to that rule. At the present time (mid 2014) there are over 330 000 temporary foreign workers in Canada. They are hired by both large and small Canadian companies. They work in skilled occuaptions, semi-skilled and low-skilled occupations, they are managers and supervisors. The number of foreign workers nearly tripled in the past ten years. In most cases temporary foreign workers are tied to the specific job and the specific employer. Despite the relatively high unemployment rates in Canada it is clear that Canadian employers heavily rely on internationally trained workers. That trend is likely to continue as baby-boomers retire, Canadian workforce ages and the number of young workers entering the work force is declining. Foreign workers need a work permit in order to take jobs in Canada (again, there are very few exceptions to this rule as well). Without LMIA their applications for work permit would be refused. Therefore Canadian employers must secure LMIA for them before foreign workers apply for their work permits and come to Canada to work. Tens of thousands of LMIA (LMO) applications get approved and denied by ESDC every year. 1) Processing fee - Effective June 20, 2014, employers applying to hire TFWs must pay a processing fee of $1000 for each position requested to cover the cost of a Labour Market Impact Assessment (LMIA). Additionally, ESDC will be seeking the authority to impose an estimated $100 privilege fee on employers applying for LMIAs to offset the costs of Government of Canada investments in skills and job training. Farm workers who enter Canada under the On-Farm Primary Agriculture program are exempt from the cap, the reduced timelines and the higher fees. 2) Average wages - The program will no longer rely on national occupation categories to determine average wages. Instead, low-wage positions will be defined as those below the provincial median hourly wage. 3) Transition plan - Employers offering a wage at, or above the provincial/territorial median hourly wage will be required to submit a Transition Plan. The purpose of Transition Plan is to identify the activities an employer is agreeing to undertake to recruit, retain and train Canadians/permanent residents and to assist TFWs to become permanent residents, if a positive opinion is issued. 4) Low-wage work permits limited to one year - Employers of low-wage temporary foreign workers must reapply every year for an LMIA, better-accommodating for changes in labour market conditions that might have occurred. Also maximum duration a temporary foreign worker can work in Canada is being reduced from the current four years (it will probably be limited to two years). 5) Faster processing of some applications - LMIAs for highest-demand occupations (skilled trades), highest-paid (top 10 percent) occupations or short-duration work periods (120 days or less) will now be provided within a 10-business-day service standard. Initially, the 10-day service standard for highest-demand occupations will be limited to the skilled trades where the wage offered is at or above the provincial/territorial median wage. 6) Cap on Low-Wage Temporary Foreign Workers - Employers with 10 or more employees will be subject to a cap of 10 percent on the proportion of their workforce that can consist of low-wage temporary foreign workers. This cap will be applied per worksite of an employer and is based on total hours worked at that worksite. To provide employers time to transition and adjust to this new cap, it will be phased in over the next couple of years. The cap will start at 30 per cent and will change in steps to 10 per cent by July 1, 2016. 7) Refusing Applications in Areas of High Unemployment - ESDC will refuse to process certain LMIA applications in the Accommodation, Food Services and Retail Trade sectors (NAIC 72, 44, 45) and NOC D occupations. Specifically, any applications for positions that require little or no education or training will not be processed in economic regions with an unemployment rate at or above 6%. 8) Inspections and monetary fines - ESDC is increasing the number of inspections so that one in four employers using temporary foreign workers will be inspected each year. These inspections will be as a result of tips, employers being deemed high-risk and random audits. Beginning in fall 2014, the Government will impose fines of up to $100,000 (depending on the severity of the offence) on employers who break the rules of the Temporary Foreign Worker Program (TFWP). 1) Processing fee - Effective July 31, 2013, employers applying to hire TFWs must pay a processing fee of $275 for each position requested to cover the cost of a Labour Market Opinion (LMO). The LMO processing fee does not apply to positions under the Seasonal Agricultural Worker Program (SAWP), the Agriculture Stream or on-farm primary agricultural positions listed under National Occupational Classification (NOC) codes 8251, 8252, 8253, 8254, 8256, 8431, 8432 and 8611. 2) Language restriction - English and French are the only languages that can be identified as a job requirement, both in LMO requests and in advertisements by employers applying to hire TFWs, unless employers can demonstrate that another language is essential for the job. The language restriction does not apply to positions under the Seasonal Agricultural Worker Program (SAWP), the Agriculture Stream or on-farm primary agricultural positions listed under National Occupational Classification (NOC) codes 8251, 8252, 8253, 8254, 8256, 8431, 8432 and 8611. Employers advertising a job for a position that legitimately requires a language other than English or French must clearly demonstrate, in writing, that the language requested is consistent with the regular activities of the job (e.g. a translation company hiring a translator to work in a language other than English or French, a tour company catering to foreign tourists only in a non-official language). Why would you want to hire a foreign worker, after all? After making a genuine effort you have not been able to find such a person among Canadian citizens and permanent residents of Canada. Foreign workers are good and reliable workers because foreign workers bet their future and the future of their families on this job! For them stakes could not be higher. They know that they have to do the job well, work hard and show loyalty to the employer because they do not have much choice - in most cases work permits are employer specific and occupation specific which means foreign workers can work only in one occupation and only for one employer. Practically all foreign workers want to stay in Canada indefinitely and they want to bring in their families as well. They can do that if they have a job in Canada (see the picture to the right). The immigration process may take sometimes two years, during that time they have to maintain their employment status (in most cases). For that reason foreign workers are reliable workforce. Unlike Canadian employees foreign workers do not count on generous supply of free money such as employment insurance, social assistance, support from close relatives etc. Canadian employee can quit the job at any time, get a note from the doctor stating he is not able to work for a month or two and he is likely to qualify for EI sickness benefits of 15 weeks. After that they can apply for federally funded training and further extend their benefits. Foreign workers only count on the job they have because that job is the key to their future. With current unemployment rate in Canada of over 7% many ask why is it that Canadian employers are not able to find qualified candidates among Canadian citizens and permanent residents in Canada? That is mostly because certain regions in Canada (mostly Alberta, Saskatchewan and Manitoba) and certain industries (construction, mining etc.) have been facing chronic shortage of skilled labour, for example skilled trades workers. Workers from eastern parts of Canada are not always willing to relocate or even if they do they tend to return back home after some time, leaving vacant positions behing them. Canadian population is getting older, the average age in Canada according to 2013 census is 41.2. Approximately one third of the population is over the age of 55. With every passing year number of senior citizens will increase. Fertility rate is declining for third year in a row falling to just 1.61 children per woman in 2011. Statistics Canada shows Canada has not met the population replacement level of roughly 2.1 children per woman since 1971. Youth unemployment in Canada stands at around 15% which is two times higher than unemployment rate for Canadians aged over 25. Why is that? Because Canadian high schools provide young people with only two types of skills: one is to conform to the social norms without asking any questions and the second one is the skill of positive thinking. It takes several years for some young people to realize that neither one of those two skills alone will land them a god job (good meaning one which will allow them to rent an apartment on their own, as opposed to living with several roommates). Many European high-schools provide vocational training so high school graduates have some marketable skills, this is not the case in Canada. Why? Because high school is free, the designers of the educational system want Canadian young adults to enslave themselves with (student loan) debt at very early age, why would they give out useful set of skills for free? It is much more profitable to import already skilled workers from other countries without investing anything in their education. Soft-skills - Canadian workplace has certain unique, unspoken cultural norms/etiquette. Mastering those rules is often referred to as soft-skills. Many foreign job seekers and newcomers alike go through a lot of frustration because they do not understand importance of soft-skills. Many foreign workers think that their work experience and educational credentials alone makes then a suitable candidate for a position, neglecting the importance and role of so called soft-skills. These challenges should not be overestimated: we can help you apply for LMIA and we can assist foreign workers with their application for work permit. In some cases foreign workers can apply for work permit at the port of entry to Canada (airports in most cases) and the whole process of Work Permit application may take 30 minutes or so. This is, for example, the case with citizens of Croatia. Canadian employers should not be overly concerned with points two and three either because at present time (2013) tens of thousands of Canadian employers, big and small, take advantage of the Temporary Foreign Workers Program and language and soft-skills issues do not appear to be a major problem at all. Once LMIA is approved employer needs to send a copy of approved LMIA and job offer letter to the temporary foreign worker who will need those documents in order to apply for work permit. The Temporary Foreign Worker Program (TFWP) enables employers to hire foreign workers on a temporary basis to fill immediate skills and labour shortages, when Canadian citizens and permanent residents are not available to do the job. Human Resources and Skills Development Canada (HRSDC)/Service Canada is responsible for assessing applications from employers requesting to hire temporary foreign workers (TFW), and issues a Labour Market Impact Assessment (LMIA) on the likely impact these TFWs would have on the Canadian job market. There are several streams within the Temporary Foreign Worker Program. Requirements for those programs and assessment process for each individual stream may vary slightly however the basic assessment factors are set out in the Immigration and Refugee Protection Act and Regulations and they apply to all TFW program streams and programs. Latest refoms of the TFW program from June of 2014 divided old TFW program into new TFW Program and introduced another program: International Mobility Program where foreign workers can apply for work permits without need for LMIA. In most cases such work permits are issued based on international agreements Canada signed with different countries around the world. At the present time (mid 2014) it takes 8-12 weeks for Service Canada to process LMIA applications. Approximately 1-2 weeks before the end of the assessment process (when employers receive a letter (through fax or mail)) Service Canada officer conducts a telephone interview with the employers. Effective June 20, 2014 certain (mostly skilled trades) applications are expected to be processed within 10 days. Is the job offer made by an employer who is ‘actively engaged’ in business? Is the job offer consistent with the reasonable employment needs of the employer? Is the employer reasonably able to fulfill terms of the job offer? Have the employer or their authorized recruiter shown past compliance with federal/provincial/territorial laws that regulate employment or recruitment in the province where the foreign national (FN) will be working? What is the occupation that the foreign worker will be employed in? Did the employer offer wages and working conditions which meet required standards? Did employer's advertisement and recruitment efforts meet required standards? Did employer conduct any consultations, if needed, with the appropriate union? Is the entry of the foreign worker likely to affect the settlement of a labour dispute? Has employer made, or has agreed to make, reasonable efforts to hire or train Canadian citizens or permanent residents? What are the labour market benefits related to the entry of the foreign worker? Is the employment of the foreign national likely to result in direct job creation or job retention for Canadian citizens or permanent residents? Is the employment of the foreign national likely to result in the creation or transfer of skills and knowledge for the benefit of Canadian citizens or permanent residents? Is the employment of the foreign national likely to fill a labour shortage? Please click on the image above - new window will open with Youtube video presentation which describes, in quite some detail, the process of obtaining LMIA and work permit for jobs in Canada. If you want to watch this presentation in HD quality please click here (new window will open). This presentation is around 50 min long, however description of LMIA application process starts at 8 minutes and 48 seconds - feel free to fast-forward to that frame. This presentation was made in 2012, since that time some rules have changed, for example at this time (June of 2014) Canadian employers have to advertise jobs for at least 4 weeks before they submit their LMIA application - in this video the old rule was explained - at that time employers had to advertise for at least two weeks. On June 20, 2014 new rules were introduced and LMO is now called LMIA however most of the information in the video is still relevant. First option that we offer to Canadian employers is that we take responsibility practically for the whole LMIA application process. Yes, employer will still have to provide some basic information about the company and vacant position, review and sign LMIA application form, have some financial information collected, photocopy a couple of documents such as business license and certificate of incorporation and pay Service Canada processing fee. Employer is also responsible for interviewing (in person or over the phone) any candidates who have applied for the position and have met basic requirements as outlined in the job ads. Once LMIA is approved instruct employer to send a copy of approved LMIA and job offer letter to the temporary foreign worker who will need those documents in order to apply for work permit. Second option that we offer to Canadian employers is less expensive one. Canadian employer would be responsible for performing most of the tasks listed under Option A, our role would be to monitor their progress and provide guidance. Instruct employer when, where and how to send LMIA application package to Service Canada. Click on the questions to open panel with answers. 1. What is the average processing time for LMIA applications? At this time (mid 2014) the average processing time for Higher and Lower skilled occupations is 8-12 weeks. In addition to that at least one month of mandatory advertising is required (if employers did not already advertise the position) before LMIA application package is submitted to Service Canada. On June 20, 2014 set of changes have been announced and one of them is 10 days processing for certain LMIA applications such as skilled trades occupations applications. 2. Are there any variations to the advertising requirement in respect to different jobs? Yes, there are. Normally jobs have to be advertised for at least four weeks before employers submit their application for LMIA however there are several special scenarios when jobs can be advertised for less than four weeks or they don't have to be advertised at all. Service Canada keeps updated list of all those exceptions on their web site. 3. How much time and effort goes into LMIA application? If you are familiar with the process (in other words if you know what you are doing) it used to take at least 10 hours to prepare LMIA application package. After June 20, 2014 changes come in force it will take more than 10 hours of work to complete LMIA application. Normally LMIA application packages prepared by MB MIGRATION SERVICES used to have between 35 and 40 pages which includes the LMIA application form and all supporting documents. After June 20, 2014 application package is likely to include even more documents. 4. How much does it cost to apply for LMIA? In June of 2014 Service Canada introduced $1000 processing fee for LMIA application. Employers have to pay $1000 for each temporary foreign worker indicated in the LMIA application form (for example if Canadian employer needs three carpenters the fee will be 3 X $1000). There are very few exceptions to that rule. In addition to that employers have to cover the cost of advertising the job (if that particular position is normally advertised on paid job sites such as Workopolis or Monster etc. In many if not most situations job can be advertised on free web site such as Craig's List, Kijiji etc.). Immigration consultants charge their professional fees for assisting employers with their application for LMIA. 5. If I want to hire a foreign worker, how long does it take for him/her to come to Canada and start working? It depends whether the foreign worker needs temporary resident visa or not; these are general timelines: one month to advertise the position, three months to process LMIA application and in case of citizens of Croatia, US etc. who do not need temporary resident visa to enter Canada they can apply for work permit at the port of entry (airport) as soon as they have positive LMIA. That would meen the best case scenario is around 4 months before foreign worker starts his job in Canada (if position is not already advertised). If foreign worker needs to apply for work permit at the visa office this may take additional two months or so. 6. How long is LMIA good for? Once issued LMIA has validity period of six month. That means that foreign worker(s) named on LMIA must apply for their work permit during those six months. Validity period of LMIA can not be extended, instead new application must be made. 7. Can employer cancel already approved LMIA? Yes. Employer needs to fax in their request for cancelation of LMIA to Service Canada office which issued LMIA. Processing fee won't be refunded. 8. Can Service Canada cancel already approved LMIA? Yes. If Service Canada becomes aware of some facts/information which are relevant to the LMIA decision after they approve LMIA they may cancel already issued LMIA. 9. Can CIC cancel work permit issued on fraudulantly obtained LMIA? Yes, they can cancel already issued work permit if they establish that information provided by the employer or the foreign worker was not truthful, accurate or complete. 10. Can Service Canada officer check if employer complied with the terms of the job offer indicated in the previous LMIA application? Yes. In some situations they ask employers to provide proof that they provided previously hired foreign workers with wages, hours and working conditions indicated in the employment contract and/or LMIA application form before they approve new LMIA for another foreign worker. 11. What are the chances that Service Canada does such review with returning employers? Service Canada goal is to review 20% of all returning employers however in reality they have manpower to review less than 10% of all employers who apply for more than one LMIA in the two years period. According to June 20, 2014 announcements one out of four employers who were issued LMIA will be inspected. It is yet to be seen if those ambitious plans will be realized. 12. What happens if employer is found non-compliant with the terms of the job offer they gave to previous foreign worker(s)? Employer may be prevented from hiring another foreign worker for two years. Also employers may be fined. 13. Can Service Canada make an unannounced visit to employers to verify working conditions of the foreign workers? Effective January 01, 2014 that is possible. How often it is going to happen is yet to be seen. 14. Can foreign worker start working once positive or neutral LMIA is issued by Service Canada? No. Foreign worker needs work permit before he/she starts working in Canada. There are (very few) situations when work permit is not required (in that case LMIA is not required either), or when work permit is required however LMIA is not required. In most situations both LMIA and work permit are required before foreign worker can start their job in Canada. 15. Can I apply for LMIA for more than one worker? Yes. There is no limit on the number of foreign workers which can be covered by one LMIA application however employers have to justify the need for any foreign workers indicated in the LMIA application, regardless whether they apply for LMIA for one person or for more than one person. 16. Can I apply for LMIA for more than one occupation? No. One LMIA application covers only one LMIA code (one occupation) and one location of work. If foreign workers are required for more than one position (or different location of work) than additional LMIA applications should be submitted (for each of the occupations/locations). 17. Do I have to name foreign worker(s) in the LMIA application? No. Normally foreign worker(s) name(s) is/are indicated in the LMIA application however it is possible to request LMIA for, let's say, ten positions and neither of those ten foreign workers are known to the employer at the time LMIA application is submitted. Once LMIA is approved Service Canada will send one additional document to the employer and employer will use that document to enter foreign worker(s) name(s) and fax it back to Service Canada. This process may take approximately one or two more months. 18. What is "Unnamed Labour Market Impact Assessment Confirmation" letter? Canadian employers can apply for a Labour Market Impact Assessment (LMIA) before a temporary foreign worker (TFW) has been identified. An "Unnamed Labour Market Impact Assessment Confirmation" letter is a positive LMIA issued to an employer when no TFW has yet been named. Employers issued an "Unnamed Labour Market Impact Assessment Confirmation" letter have six months to identify any TFWs and have them apply for a work permit. Employers can apply for an "Unnamed Labour Market Impact Assessment Confirmation" letter for one or more positions. However, employers must continue their efforts to recruit Canadians and permanent residents to fill the position(s) indicated on the LMIA application until they have selected the TFWs. Attached to the "Unnamed Labour Market Impact Assessment Confirmation" letter is the "Foreign Worker Name Template". Once the TFWs are recruited, the employer will use the template to submit the missing information to HRSDC/Service Canada. HRSDC/Service Canada will issue an official LMIA confirmation letter, including the name(s) of the TFWs, once the required information is provided. This confirmation letter is to accompany the TFWs' applications for a work permit from Citizenship and Immigration Canada. Information on Service Canada web site indicates normally HRSDC/Service Canada processes and issues the official LMIA confirmation letter within five business days after receiving the TFW information. In reality it takes 1 to 2 months for Service Canada do add the name of the TFW to already approved LMIA. 19. If LMIA is approved does that mean that work permit application will be approved too? Not necessarily. Service Canada is responsible for issuing LMIA and another government department is responsible for issuing work permits (CIC). Statistics on HRSDC web site indicate approximately 50% of approved LMIAs turn into approved work permits. Anecdotally higher percentage of work permits is approved at the Canadian border than at the visa offices abroad. Hiring foreign nationals who do not need visitor's visa to come to Canada (such as citizens of Croatia) is likely to have higher success rate when it comes to their applications for work permits. 20. Can LMIA be used for the purpose of applying for Permanent Residence in Canada? Yes, in certain situations and certain programs employers may apply for LMIA to support foreign national's application for permanent resident status in Canada. Such programs, for example, are Federal Skileld Worker program and Federal Skilled Trades program. 21. What about the provicen of Quebec? Do they have different rules when it comes to application for LMIA? Yes, LMIA application process is slightly different in the province of Quebec. One of the major differences is that as of recently all LMIA applications in the province of Quebec must be submitted in French language, otherwise they won't be processed. 22. Who is making hiring decision, employer or immigration consultant? Employer has the last word when it comes to hiring (or not hiring) any of the candidates who respond to the job ads posted by the immigration consultant on behalf of the employer. Immigration consultant is responsible for preparing the job ads (with input and approval from the employer), for posting the vacant position according to Service Canada rules, for collecting all resumes and cover letters and forwarding them all to the employer. Before responses are forwarded to the employer immigration consultant does preliminary review of all receives resumes and creates a report for the employer. For example, if the employer is looking for someone with college diploma and two years of work experience immigration consultant will list the names of all candidates who applied for the job and next to the name indicate that particular applicant did not have required education or work experience (if that is the case). Employers are advised to review all received resumes one more time before they decide which candidates they want to call for an interview. It is employers decision to hire or not to hire any of the job applicants. 23. Is Service Canada officer going to conduct telephone interview with the employer before they approve LMIA? Yes, in practically all situations Service Canada officer will call the employer approximately 10 days before the decision is made and discuss the particulars of the LMIA application with the employer. 24. What are the factors that determine success of LMIA application? These factors have to do with the formal side of the application: LMIA application form needs to be properly completed, job advertised according to Service Canada requirements, proof of advertising record submitted, fee paid etc. Immigration consultant has full control over these factors. These factors depend on employer's compliance with previously made job offers to temporary foreign workers, they also depend on employer's ability to clearly articulate employer's need for foreign worker(s) during their conversation with Service Canada officer etc. Immigration consultant has only partial control over these factors - consultant will inform the employer what they can expect from the telephone interview with the Service Canada officer and how answer those question in the best way. These factors are totally outside of control of both the employer and their representative - if Service Canada officer thinks (based on their laboour market information sources) that employer should be able to find qualified Canadian citizens or permanent residents for the vacant position there is really very little that employer or their representative can do about it. It is very likely that Service Canada officer will suggest that employer advertise the position longer or that employer uses different means of advertising the job. 25. Is it possible to appeal negative LMIA decision? There is no formal appeal process in place however employer or his representative can fax request for reconsideration to the program manager and provide some additional information/facts which are material for the LMIA application and the decision made. In some instances Service Canada reverses their decision and approve LMIA after new information is provided. 26. Can anyone submit LMIA application on behalf of the employer? No. Only authorized representatives (as defined in the subsection 91(2) of the Immigration and Refugee Protection Act (IRPA)) can conduct business with Human Resources and Skills Development Canada (HRSDC) and Citizenship and Immigration Canada (CIC). Lawyers and paralegals in good standing with a provincial or territorial law society. 27. Can temporary foreign worker named in LMIA application call Service Canada and inquire about the status of the application? No. Only employer and employer's authorized representative will be given information pertaining to employer's application for LMIA. 28. 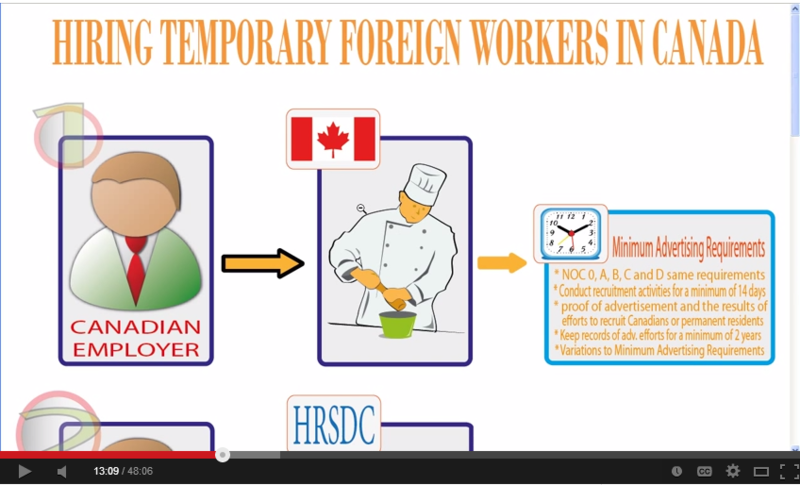 What are the changes to the Foreign Worker Program which are implemented on June 20, 2014? Inspections and harsher fines for employers. If you have any questions about LMIA process or you need assistance with your LMIA application we will be happy to hear from you. We make every effort to respond to all messages within 24 hours. Our telephone number is 604-616-2299. Our preferred method of communication is e-mail. Milorad Borota is a Regulated Canadian Immigration Consultant with ICCRC registration number R408031. 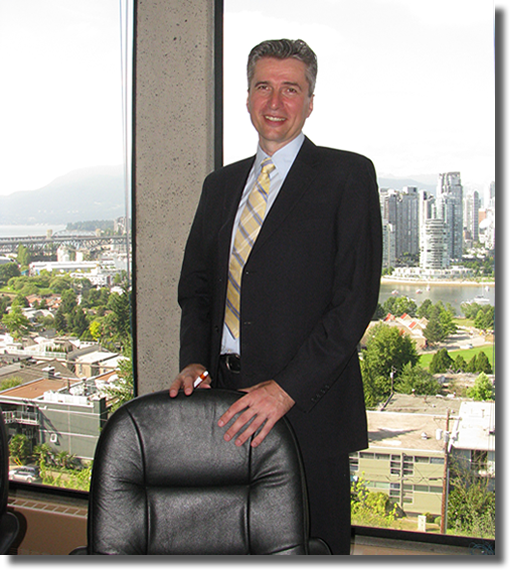 He is the principal consultant at MB MIGRATION SERVICES which is Canadian immigration company based in Vancouver, BC. This company and this consultant specialize in providing services to Candian employers and temporary foreign workers (applications for LMIA, work permits, permanent resident status through Canadian Experience Class and through Provincial Nominee Programs).